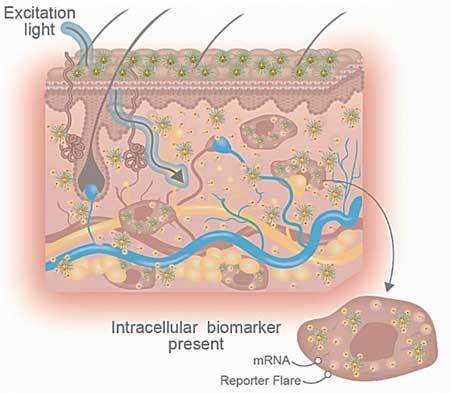 (Nanowerk News) In a new SLAS Technology commentary ("Simplifying Skin Disease Diagnosis with Topical Nanotechnology"), two authors of an article recently published in Nature Biomedical Engineering ("Abnormal scar identification with spherical-nucleic-acid technology") share more insight into their unique method for skin disease diagnosis using NanoFlare nanotechnology. In particular, the authors address point-of-care diagnosis and image acquisition, which are the primary bottlenecks in efficient disease diagnosis. Authors David Yeo, Ph.D., and Prof. Chenjie Xu, Ph.D., of the School of Chemical and Biomedical Engineering at Nanyang Technological University (Singapore) use NanoFlare to enable biopsy-free disease diagnosis and progression monitoring in response to therapy. It is a minimally-invasive, self-applied alternative that can reduce scarring and infection risks; improve accessibility to disease diagnosis; provide timely feedback of treatment efficacy; and reduce healthcare personnel time and attention, hence the overall healthcare burden. This vision of simplifying disease diagnosis using topically-applied nanotechnology could change the way skin diseases such as abnormal scars are diagnosed and managed.